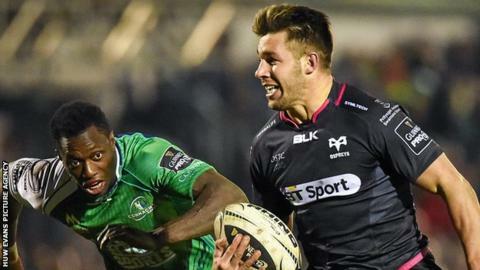 Ospreys bemoaned a refereeing controversy as they had a "clear" try disallowed in their defeat at Connacht. Fly-half Sam Davies thought he had brought Ospreys level at 27-27 but was penalised for a double-movement following a tackle by Kieran Marmion. Following the decision by Irish television match official Jude Quinn, Connacht went on to win 30-22. "It's a try," said Ospreys forwards coach Chris Gibbes. "Clear and obvious. It's a try. We've come here to score four tries and through an officiating situation, we've missed that opportunity to get the fourth try. "It's pretty clear and obvious, but that process is flawed. We're disappointed with that." Ospreys' defeat was a blow to their hopes of reaching the Pro12's end-of-season play-offs, leaving them in seventh place and eight points behind the top four. Connacht stretched their lead at the top of the table to six points, and Gibbes was frustrated to leave Galway without even a losing bonus point. "It wasn't a good performance," he added. "When there are so many missed tackles you are going to come off the wrong side against a pretty good, committed Connacht side. "It's a tough place to come and play but the performance wasn't good enough and we are pretty disappointed about that."